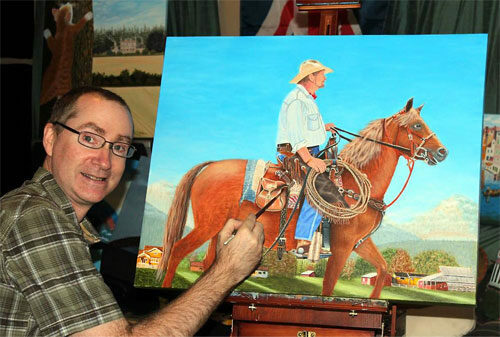 A few notable paintings from Canadian painter Doug Giebelhaus are of icon Flying Phil St. Luke "Parade Day" of Parksville and "Lantern Festival" that was featured in a popular international TV series. He started painting in water colors while living in Edmonton in the early 1990's then switched to acrylics shortly after. He has studied Acrylic Painting and Design at the University of Alberta. In 2000 Doug moved to Parksville, Vancouver Island, British Columbia and continued developing his style as a Figurative Acrylic painter. He likes to use his digital camera to capture meaningful moments in time of people in real life situations or events and turn them into paintings. Some of Doug's influences are "John Singer Sargent", "Pino Daeni" and "William Adolphe Bouguereau".